Profit Squad is a matched betting service which helps members make a profit from bookmaker and casino free bets and bonuses. This matched betting guide will explain what matched betting is and how it can help you bring in an additional income. Matched betting is the method of extracting a profit from bookmaker promotions such as free bets whether your bets win OR lose. When first hearing about matched betting, many believe it too good to be true but hopefully, once you’ve finished reading this guide, you’ll understand that making a profit from your bets, regardless of the result, is entirely possible. With so many different bookmaker offers around, the process of extracting a profit from them varies. However, the main principles remain the same and involve placing two bets – a back bet and a lay bet. Back bets are when you are betting on something to happen and are placed on bookmaker websites. For example, you may back Man Utd to beat Arsenal or for the correct score to be 2-1. If your bet wins, then the bookmaker will pay out at the given odds. Lay bets are slightly different in that you are betting on something NOT to happen. For example, you may lay Man Utd against Arsenal. In this case, your bet would win if Man Utd DO NOT win the match ie. If the match ends in a draw or Arsenal win. Lay bets cannot be placed on bookmaker websites and we use betting exchanges to place them. Some popular betting exchanges are Betfair Exchange, Smarkets, Matchbook and Betdaq. The reason for placing both a back bet and a lay bet when matched betting is to cover all outcomes so that you are guaranteed to win one of your bets. Now that we’ve covered back and lay bets, let’s get into how you actually make a profit from matched betting. Let’s take a look at an example bookmaker offer and see how much profit we can make from it. The offer above is an example of a typical bookmaker offer which are available on a daily basis. Usually, a punter would place a £10 bet, hope that it wins, receive the £10 free bet and again, place that on something and hope that it wins. Both bets could win and return a profit but both bets could lose leaving you out of pocket. When matched betting, we eliminate this risk by covering all outcomes. So, to receive the £10 free bet, we first need to place a £10 bet with our own money. To ensure that we don’t lose our initial £10 bet, we place both a back bet and a lay bet. The aim of this step, known as the ‘qualifying bet’, is to qualify to receive the free bet for as little cost as possible. It is when we use the free bet that we will make an overall profit. Let’s say that we want to place our £10 qualifying bet on Man Utd to beat Arsenal. We need to find the back odds and the lay odds for Man Utd to win. We’ll find the back odds on the bookmaker website and the lay odds on a betting exchange. Now that we know the odds, we need to place our bets. 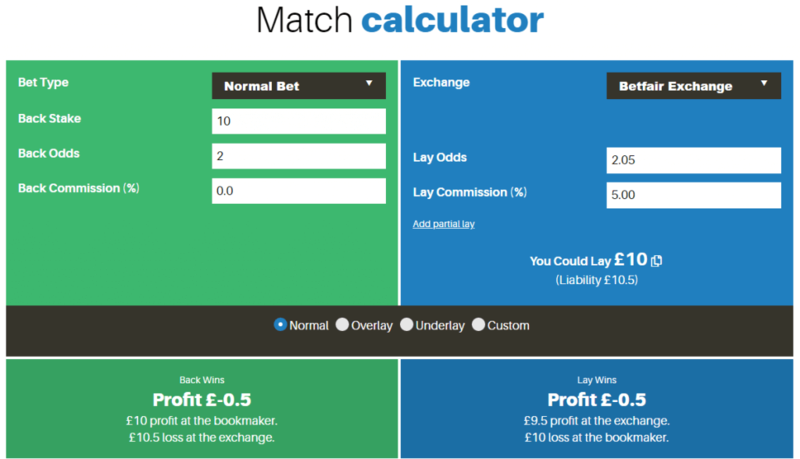 We know that our back stake with the bookmaker is £10 but to calculate the ideal lay stake for our bet, we need to use a matched betting calculator. The ideal lay stake ensures that we return the same amount whatever the result. Profit Squad provides a matched betting calculator to all members. Using the matched betting calculator, we input our bet details such as back odds, lay odds and which exchange we’re using and is calculates the ideal lay stake for our bet. In this case, it tells us that we need to place a £10 lay bet on Man Utd using Betfair Exchange. This lay bet will have a liability of £10.50. Liability is the amount you stand to lose if your lay bet doesn’t win. With back bets, if your bet doesn’t win, you will lose your stake amount. However, with lay bets, the stake is the amount of profit you will make if your bet wins and the liability is the amount you will lose if it doesn’t. So, now that we know our back and lay stakes, we need to place our bets. The calculator shows us our profit/loss depending on whether our bet wins with the bookmaker (if Man Utd win) or with the exchange (if Man Utd don’t win). In this case, we will make a £0.50 loss whatever the result of the match. You will find that you will make a loss on your initial qualifying bets. However, this loss is generally very small and as mentioned, it is when using our free bet that we will make a profit. A profit which is a lot greater than our qualifying loss. We’ve now placed our qualifying bet and have made a loss of £0.50 but have received a £10 free bet for doing so. We now need to use our free bet to make a profit. We simply repeat the process of backing and laying a bet, this time using our free bet. TIP: When using your free bets, you will return a bigger profit on bets with odds of 5.0 or greater. Let’s say that we want to use our free bet on Burnley to beat Liverpool. We need to find the back odds and the lay odds for Burnley to win. 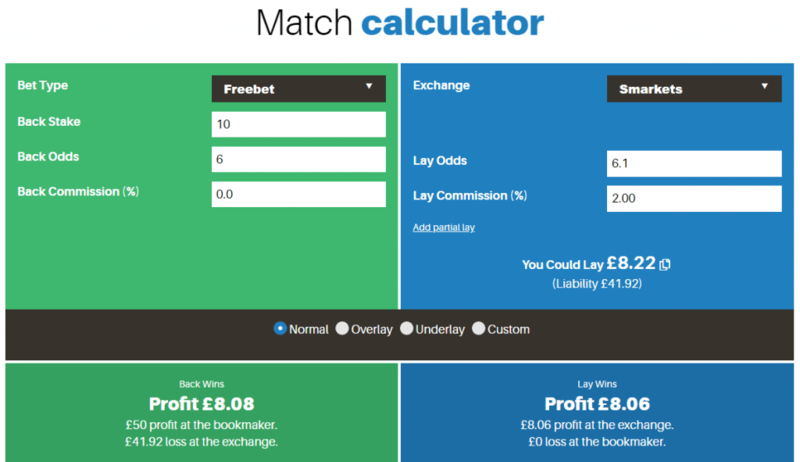 We again input these bet details into the matched betting calculator to determine the ideal lay stakes and to see how much profit we will make. As you can see from the calculator above, if we placed our £10 free bet with the bookmaker and placed an £8.22 lay bet on the exchange, we would make a profit of £8.08 if our bet wins with the bookmaker and a profit of £8.06 if our bet wins with the exchange. We made a loss of £0.50 qualifying for the free bet and so we will make an overall profit of £7.56 – £7.58 from the offer. The example above shows how we can make a profit of around £7.50 from just one free bet offer. There are hundreds of these offers available which should give you an idea of the potential matched betting has in generating an additional income for you. Several Profit Squad members make four-figure profits on a monthly basis but even if you dedicate just a few hours per week, you will still be able to generate a good profit. The easiest way to find profitable offers is to join Profit Squad. We scour the bookmaker websites every day to find the best offers and list them in the members’ area of our site along with step-by-step guides on how to extract a profit from each one of them. Members have access to a range of user-friendly matched betting tools to make the process quick and easy and support is available 7 days a week should you need any help.